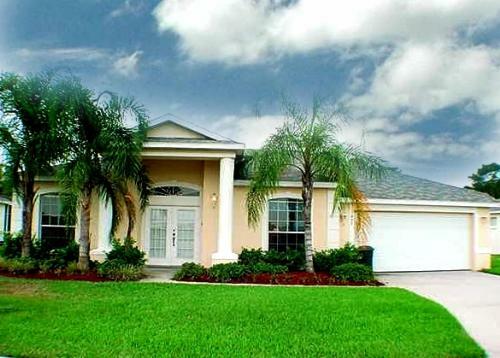 4 bedroom, 3 bathroom villa in the Bridgewater Crossing community. Owned by david dyer. Ref: 1963. Overlooking a lake and conservation area. Computer with free Wireless high speed internet access. For privacy reasons, the marker on the map shows the Bridgewater Crossing community location and not actual villa location. ABSOLUTELY PERFECT!!! 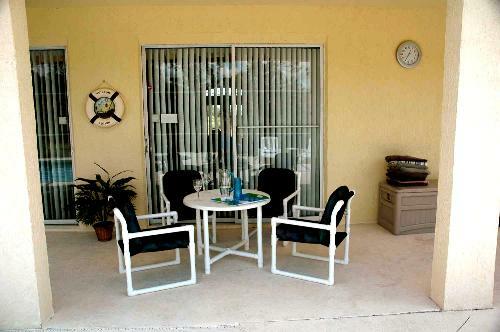 Our beautiful home, ideally situated just 8 minutes from Disney - 1 junction on I4 and close to ChampionsGate Championship Golf Course.It is the ideal base for your Florida Vacation. *Computer with High Speed Internet Access. 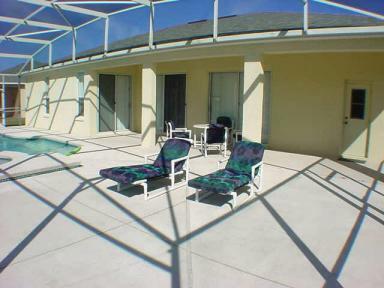 *Private south facing pool and spa with extensive pool deck which can be lit at night. 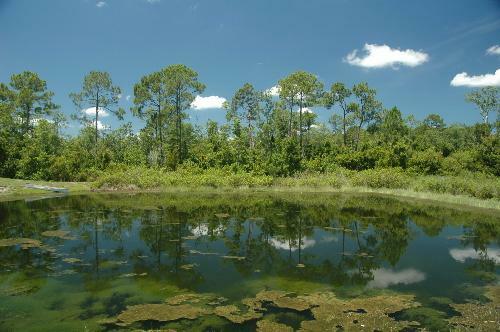 *Lake view, overlooking conservation area. *VCR and DVD players provided. *Utility Area with Washer and Tumble Dryer. *Complimentary use of High Chair and 2 strollers. Games room with Pool Table, table tennis and air hockey. Our luxurious 4 Bedroom 3 bathroom home is situated in a superb location just one junction from Disney’s Maingate and 3 minutes away from ChampionsGate golf course. 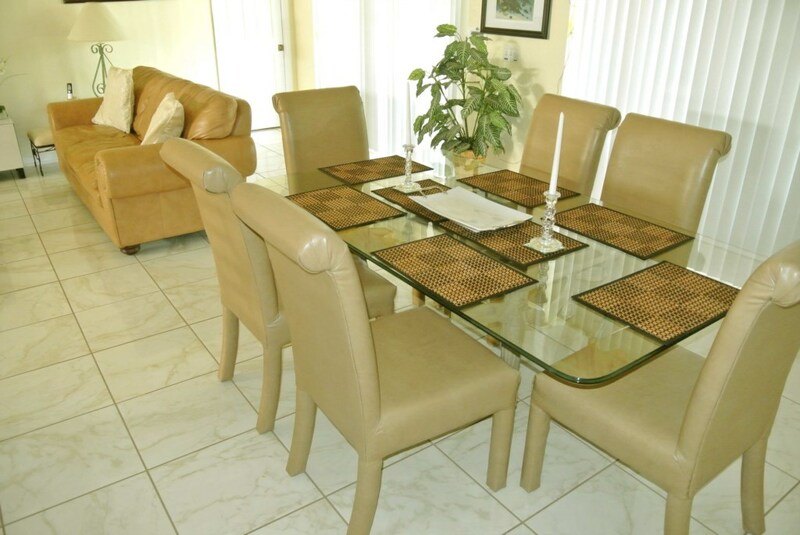 At the nearby ChampionsGate area you will find a number of shops including, Publix supermarket, Walgreens, Little China (restaurant), UPS store, Video rental store and Mc Donalds. There is also a Gas station (petrol station). A Wal-Mart superstore is just 10 minutes south on US 27. On our up-market development, guests are free to enjoy the floodlit tennis, basketball and volleyball courts. There is a community swimming pool (with changing rooms and toilet facilities) which has spectacular views of Lake Madison and the nature trail. There is also a children’s play area. Our home overlooks a pond and conservation area. The fully air-conditioned accommodation comprises of a spacious open plan lounge (with 50”cable T.V, video and Hi-Fi) and dining area which overlooks the pool. There is a choice of movies available for use. The lounge has a 2 three seater leather sofas , coffee table and two side tables with lamps to create a relaxing atmosphere. 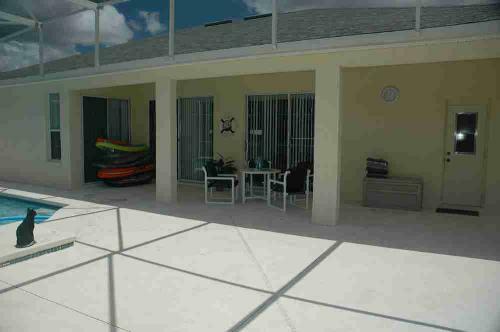 Outside, the pool and spa are south facing with a view of a pond and conservation area with sun all day long. There is an extensive pool deck area (extending the whole width of the villa -55ft) with 4 sun loungers and table and chairs. 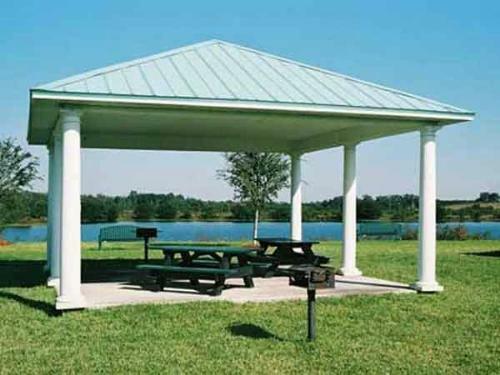 The area is completely covered but allows in the beautiful Floridian sunshine, but keeps those little bugs out! The pool and lanai can be lit in the evening for outdoor entertaining and to experience the tranquil surroundings. An ample supply of plastic glasses is provided for use on the pool area to avoid accidents with broken glass and a gas BBQ is available free of charge. 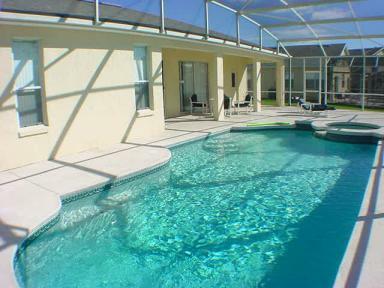 The pool can be fully heated at an additional daily charge. Our management company services the pool weekly in order to keep it to the highest standards. The fully equipped kitchen includes cooker, microwave, dishwasher, waste disposal, fridge freezer with ice making facilities. In fact, everything you could possibly need. There is a separate utility room with large washing machine and tumble dryer, iron and ironing board are provided for your convenience. 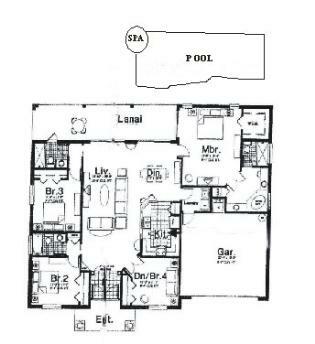 There are 3 bathrooms. 1 master en-suite, one Queen en-suite which can also be accessed from the pool deck and another separate bathroom shared with the other two bedrooms. A hair dryer (in each bathroom) is provided for your use. 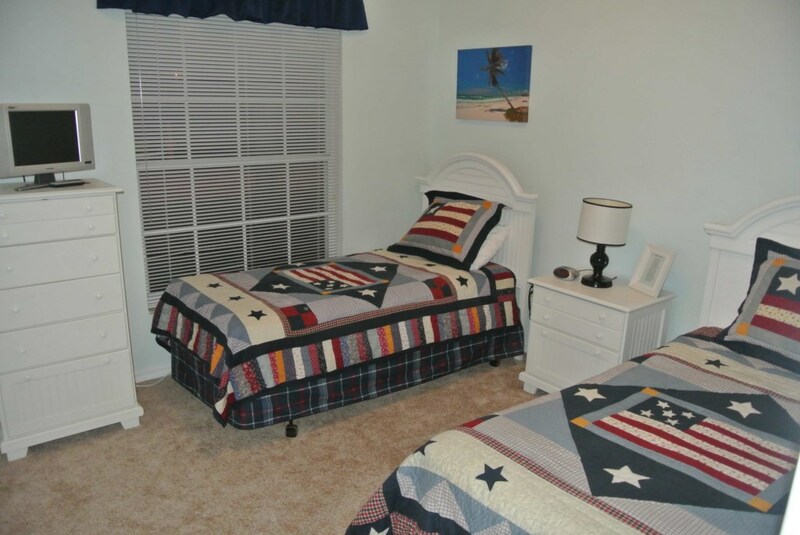 The master bedroom has a King size bed, luxury bedding, cable T.V, DVD player and alarm clock and large walk-in wardrobe, two bed side cabinets, chest of drawers with mirror and TV cabinet. There are double doors opening out onto the pool-deck. In the walk-in wardrobe can be found a child’s high chair and Travel cot/Playpen and Safe. 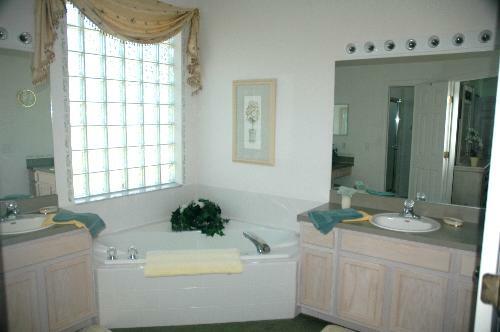 There is a large en-suite bathroom with his and hers vanity basins and large corner bath. 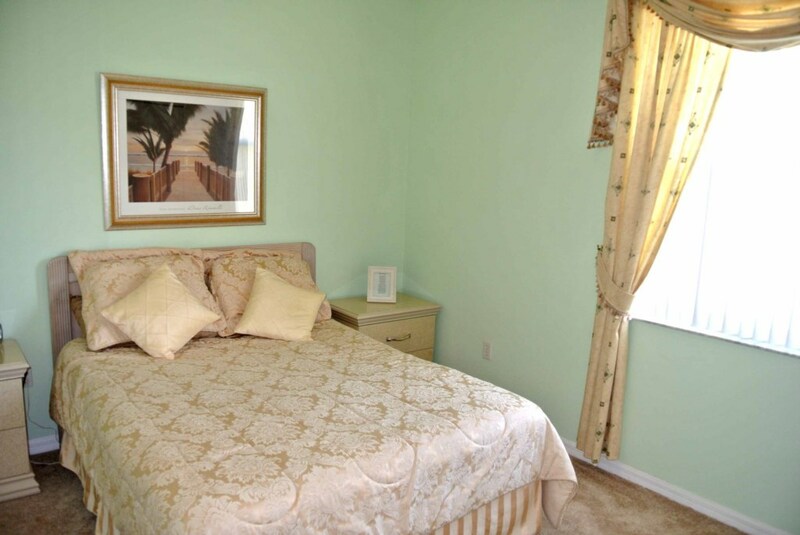 The second bedroom has a Queen size bed, luxury bedding, TV with built in DVD player and an alarm clock. This room has a fitted wardrobe, two bedside cabinets and chest of drawers with mirror. 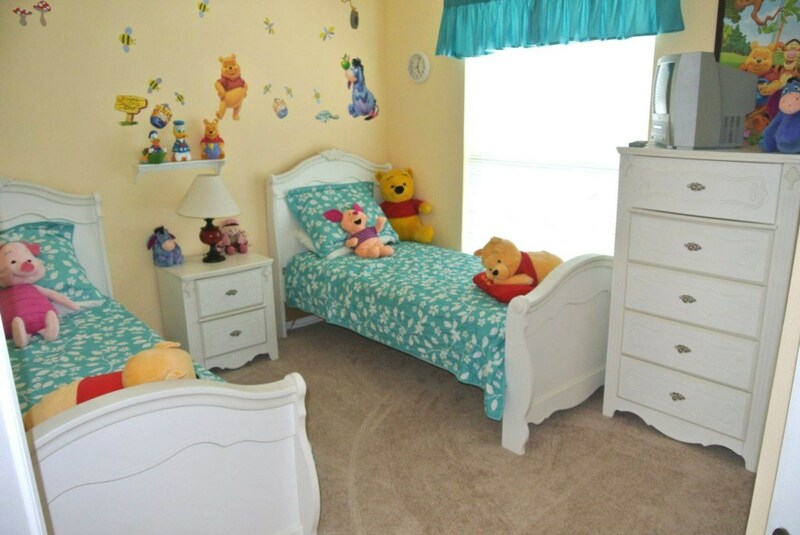 The fourth is a Disney themed room with a 3 sleeper bunk bed, TV and Playstation 2, with a selection of games, toy box and soft toys and large chest of drawers. 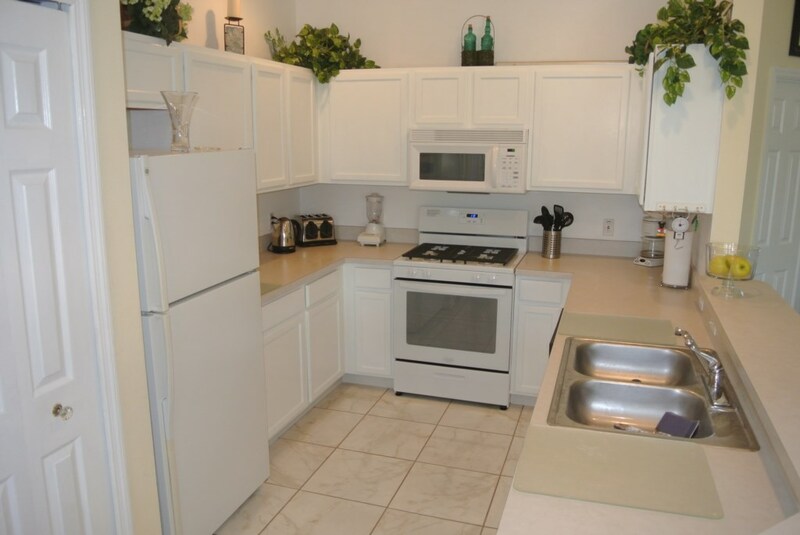 PC with free unlimited wireless broadband internet access. Cordless telephone with free local calls. 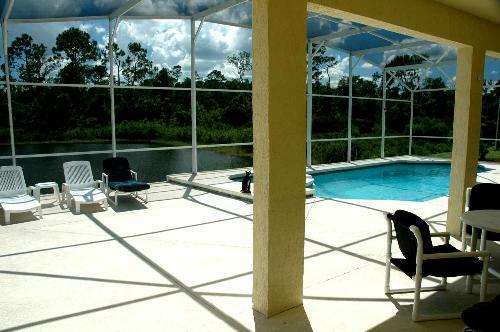 Our home is fully licensed and registered in the State of Florida and managed locally by a professional management company who ensures that the lawns, pool and property are maintained to a very high standard. Furthermore, a co-ordinator is on 24hr call-out for emergencies. Just about to head back home after a fantastic two weeks in Florida, we have been here as a family on 6 separate occasions and although we have always stayed in good quality hotels, Disney, Marriott World Resort and so on your villa has spoilt us for hotels in the future. The space, private pool, wildlife and furnishings made this a holiday to remember. We had a wonderful time in your home. Its beautiful. We had a wonderful time, it went by way too fast. Your villa is very, very nice, one of the best we have stayed in. 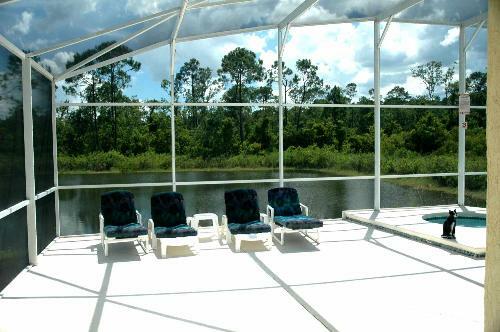 We really like the location (Bridgewater Crossing) and the orientation of the home for sunbathing. 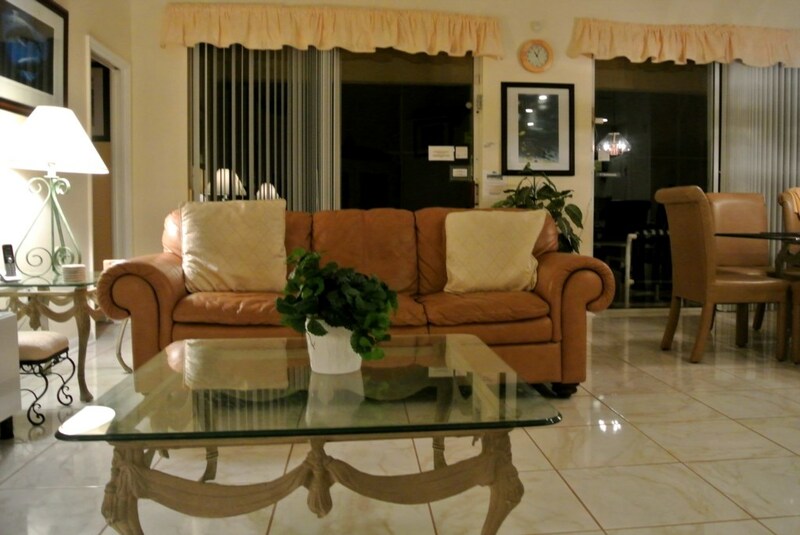 It has the largest lanai and pool area, than the rest of the villas we have used. I just wanted to thank you so much for the easy rental procedures, as I was a little sceptical at first about renting online. Thank you again for letting us use your beautiful home. The villa had every convenience of home and was sparkling clean when we arrived. 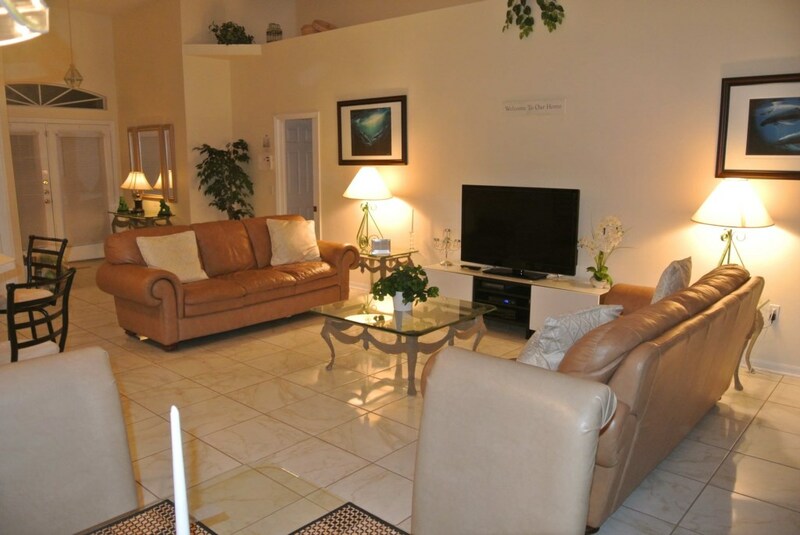 Your home is beautiful, and your management group was friendly and very helpful. We enjoyed the pool and the weather was wonderful. I would definitely recommend your home to my friends. 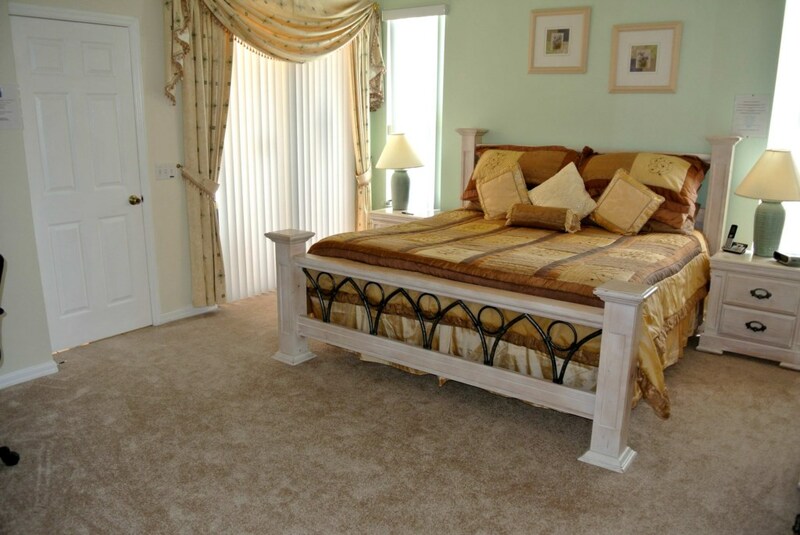 The spacious layout allowed us ample room and privacy, and was comfortable and spotless. Your villa is very nice and comfortable. We had a great time and must thank you very much for allowing us to have the use of your villa. Hello, we had a wonderful time vacationing in your home, the only bad thing about it was having to leave. You have a very nice home and we thank you for helping us out with such short notice. Just a quick e mail to thank you for letting us spend a fantastic ten days in your lovely villa. Just a quick email now we are back in the UK to say we enjoyed our holiday and thoroughly enjoyed staying at your villa. We really enjoyed our time at your villa. I have already recommended it to another family member. Had a great time, will definitely recommend your villa. Superb location. Arrival Day - any day -take advantage of midweek flights. Balance due 10 weeks in advance. Minimum Stay - No Minimum period. Stays of less than 1 week = a cleaning charge of £50 ($90) applies. Your enquiry will be sent to villa ref 1963 only. This page has been viewed 12288 times since 11 Feb 2005.